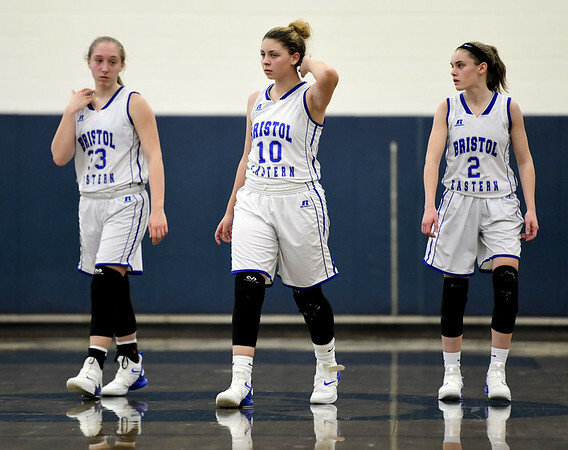 BRISTOL - Finding themselves down 11-2 in the opening minutes of Saturday’s game, the Bristol Eastern girls basketball team knew they needed a quick turnaround to stretch their winning streak to four games. The Lancers got just that responding with a 23-6 run over the rest of the first half to run away with a 57-40 win over Rocky Hill, giving Eastern plenty of momentum heading into its final regular season game against rival Bristol Central on Monday. Jordan Ouellette led the Lancers with 24 points, while Ciara Collins scored eleven. Avery Arbuckle and Cali Doyon each added six, and Paige McLaughlin added five to pace the attack. Nikki Lukens scored 19 to lead Rocky Hill. Eastern 8, Hall-Southington 4: Hall-Southington held a 3-2 lead in the second period, but four-straight goals by Eagles led to an 8-4 loss on Senior Day. Duncan Hollander scored two goals in the losing effort, while Michael DiPietro and Bobby Allan added the others. Hall-Southington was outscored 4-1 in the third period, as Eastern added two goals from Ryan Huta, while Kyle Jacobson added a goal and three assists to hand Hall-Southington its second-straight loss. Goalie Noah Behrens-Gould was kept busy all night for Hall-Southington, stopping 41 shots in the crease. Records: Bristol Eastern 12-7, Rocky Hill 8-11. Goals: Evan Tower (E), Bobby Allan (HS), Tower (E), Duncan Hollander (HS), Michael DiPietro (HS), Will Cannella (E), Kyle Jacobson (E), Ryan Huta (E), Ashton Baltes (E), Hollander (HS), Huta (E), Cannella (E). Saves: Noah Behrens Gould (HS) 41, Rylin Fowler (E) 23. Records: Hall-Southington 5-10, Eastern 11-4-1. Posted in The Bristol Press, Southington on Saturday, 9 February 2019 21:35. Updated: Saturday, 9 February 2019 21:38.